When I finally made the decision to let it all go, the next question was "How do I do this?" For more on what led me to the decision to shave my head, see my article here. There are clippers that claim they can shave your head bald. They lie. They can get your hair close, but not as close as I like. There are depilatories (chemicals) that can remove the hair from your head. I considered those. But, I decided to start by using a razor. Three years later and I've found that technique works really well for me. When it comes to razors, there are so many options it's dizzying. Do you use the old fashioned "safety razor"? I saw that some men are going back to those. They're very cheap. They're better for the environment, with a lot less waste to fill up landfills. They shave close enough. However, there's a caution. You have to be very careful with them because pull them across your head or face at the wrong angle and they can slice you. There seems to be a bit of a learning curve to using them. The more contours you have, the more chances that you'll cut yourself. I'd give them a try on my face. I'm not going to try them for my head though with all of the curves and hills and valleys I need to cover to get it shaved properly. The blades I use (six blade razor from Swipe) last me two to three weeks. So, I'm not going through that many. They are pretty economical compared to the big names like Gillette and Schick which I have tried. They're even less expensive than the online places you can subscribe to. So, for now, I'm using those. As for lubricant, which you will need, you can go with a shaving oil which I have used on occasion, a shave gel, or a shave foam. I use our Ajuven all natural shave gel because it has ingredients that provide not only lubrication but that lift the hair giving you a closer shave. It's all natural and is gentle on both my face and scalp. 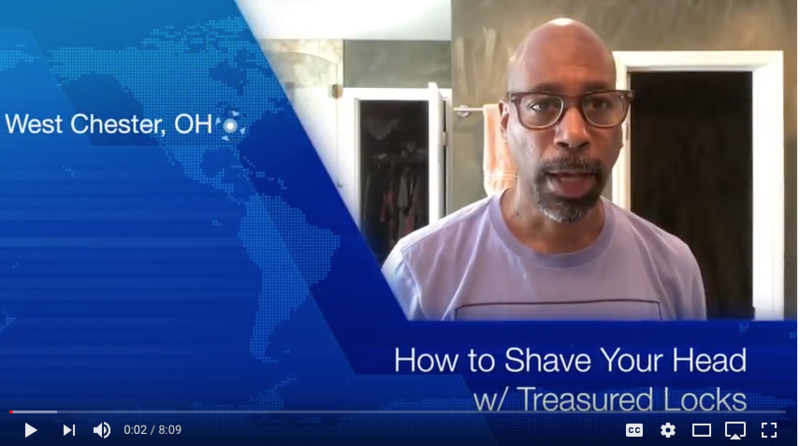 Where To Shave Your Head? Where to shave? I always shaved my face at my sink in front of a mirror. Shaving in the shower is great for shaving your head. You have an unending flow of hot water to rinse your blade as you go. You'll want to rinse frequently. You can purchase a fog-free mirror to place in the shower if you need it. Chances are if you're clean shaven on face and head you won't need a mirror. I don't need to see my head when I'm shaving. I use my hand to feel what has been cut and what still needs work. I do however need a mirror to trim around my goatee. So we've covered the tools. When it comes to the process of shaving itself. You'll want to take it slow and steady, especially when you're starting out. The skin on your face is thinner than the skin on your body. The skin on your scalp is thinner still. There are lots of blood vessels in your scalp. Nick it and you might bleed for quite a while, not to mention your scalp has a lot of nerve endings. I recommend wetting your head first. Then, you apply the lubricant, then start to shave. You'll want to take slow smooth strokes in the direction your hair grows. Rinse the blade often as especially with these multiple blade cartridges; hair will collect between them quickly. As you become more advanced and your scalp gets used to it, you can start to go against the grain to get a super smooth cut. I don't think it makes any difference to the appearance, but it will make your head feel smoother. Caution: This could very well lead to razor bumps for a lot of men. If you have particularly curly and thick hair, I would not recommend it. After you've shaved, allow your blades to dry as best you can for longer blade life. Even if you shave in the shower, you might want to move your razor out after you've shaved so it can dry. Also, this reduces the growth of bacteria on the blade which can lead to infected razor bumps. I've been shaving my head for about three years and have fully embraced the bald look. My routine consists of Ajuven Botanical Scrub to clean my face. My skin is naturally oily, so I don't use a moisturizer. If you have dry or combination skin, you might want to use our Ajuven Facial Moisturizer. If your skin is oily, like mine, our Ajuven Citrus Splash Astringent will balance that right out. Our Ajuven Aloe Shave Gel is excellent. I'm fortunate in that I don't have to deal with razor bumps. I've found shaving my head to be comfortable and painless. I've only had a couple of nicks in the three years. I've made a video showing you the technique and talking you through everything I've covered in this article. Shaving my head once a day takes less time than a lot of people spend combing their hair. I decided to give it a try three years ago thinking it might be too much work. I was using clippers before this. If you don't like shaving your head, you can always go back to what you're doing now. It's a low risk thing to try. I love the slick feel of a closely shaved head. My head does get cold in the winter, at times. Hats are more common for me than they used to be.